Canadians will be going to the polls Oct. 19 for the nation’s 42nd federal election. 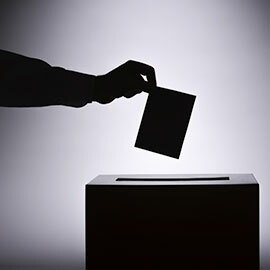 Any Canadian citizen who is at least 18 years of age and on the registered list of voters can vote on Election Day. Below, find some useful information to help you participate in the democratic process. Oct. 19 is Election Day across Canada. Polls will be open for 12 hours; you can find your polling station by entering your postal code on elections.ca. Students can vote in either their hometown’s riding, or the riding they live in while at school. If you received a voter information card in the mail with your current address, take this card along with proper photo ID to your polling station on Oct. 19. REGISTER ON ELECTION DAY: You can also register on Election Day at your polling station just before you vote by providing proof of your identity and proof of your local address. E-statements and e-bills are accepted either in printed form or shown on a mobile device. A full list of documents that will be accepted as proof of identity and address is available on the Elections Canada website. RESIDENCE STUDENTS: For students living in residence, a letter of confirmation of residence is accepted as proof of address. You can find this form on your LORIS account under the “Personal Information” section. Print this form and bring it to the poll with a government issued ID to vote on Oct. 19. IF YOU DON'T HAVE PROOF OF ADDRESS: If you cannot provide proof of your local address, someone who knows you and is registered in the polling division you are attempting to vote in can take an oath attesting to your address. You will need to show two pieces of ID and the person swearing an oath will need to prove their identity and local address. A registered voter can only attest for one person. Your polling station will depend on your address within your riding. To find out where you go to vote, visit the Elections Canada website and enter your local postal code. Laurier’s Waterloo campus will host a polling station in the Concourse in Fred Nichols Campus Centre on Oct. 19. This station will be for students living in residence on the Waterloo campus and the area immediately around the university. While the party leaders get all the headlines, it’s the local candidates you’ll see on your ballot. Click on the links below to find out who’s running in each of the ridings Laurier’s campuses and locations fall into. If you live in a riding aside from these four, you can find candidate information by entering your postal code on elections.ca. There is no shortage of ways to follow the issues and information pertinent to this election either online or through traditional media. Laurier student groups have launched campaigns to provide more information to students and help you engage with the election. The Wilfrid Laurier University Students’ Union’s #LaurierVotes campaign features helpful information and additional resources to make getting informed and voting easy for students. Find information online or on social media by following @Students_Union on Twitter or using the hash tag #LaurierVotes. The Laurier Students Public Interest Research Group (LSPIRG) is looking to encourage democratic participation and help get students informed on key issues surrounding this election through their Your Voice Matters campaign. Find out more by visiting the LSPIRG website or by following @LSPIRG and the hash tags #yourvoicematters and #itsnosecret on social media.